Westerns. One of the most enduring and mythic genres that the world has ever seen. But what makes them so popular? Is it their ability to pit man against wild? To tell stories of how civilization overcame the untamed frontier? Or is it all those lovely, lovely hats? On this trip I will be journeying through the history of Westerns, and sharing my thoughts on them as a relative newcomer to the genre. So sit back, relax, and chew on some tobacco. This is Richard’s Western Odyssey. Enjoy! So then. Westerns. I’ve seen a handful, enjoyed most of them. But I’d never consider myself an expert on the genre. Far from it. I’ve always been slightly embarrassed with how few of them I’ve seen, and I’ve known for a while that I must right this blind spot in my film knowledge. That’s what the point of this series is, to expand my knowledge of the genre and offer my brief thoughts and opinions of the films I watch along the way, viewed through the eyes of someone relatively new to westerns. The two films I’ll be talking about today are 1962’s How the West Was Won and 1939’s Stagecoach. How the West Was Won is a pretty great film. The best thing I can say about it is that immediately after watching it I felt more comfortable in and familiar with the genre as a whole. A big part of this is down to the film’s structure. Five separate yet connected stories that take place over a fifty year period (1839-1889) and told over a mammoth 164 minutes, it follows the Hawkins family as they try to make their way in the West. Each section deals with a different time period, and thus a different theme associated with the old West. So we have “people vs. the wild, untamed wilderness” in the first section, with the family having to traverse a raging river on shoddily built rafts (it doesn’t end well), and then we have a cavalcade travelling the vast planes whilst fending off attacks from Native Americans. We then move onto the Civil War. Now, in my head the American Civil War and the Old West are two distinct periods separated by many years, but watching this film has reminded me that this confusion is mainly due to a geographical difference, with much of the fighting occurring away from where we consider most Westerns to take place, so it’s nice to be reminded of this. The last two sections deal with the arrival of the railways to the land (man finally conquering nature), followed by a section on Outlaws (man rebelling against that control and wanting to get back to nature). This is exemplified by the finale, an action scene set on a train which is partially destroyed in thanks to the attacking outlaws. That’s How the West Was Won, onto 1939’s Stagecoach. The set up for this one is pretty basic: nine strangers must ride a stagecoach across the open plains. All are not telling the entire truth, and they must fend off an attack by Apaches. Told over a comparatively brisk 96 minutes, it somehow feels longer than How the West Was Won. Both the film and the stagecoach is constantly stopping and starting. Its pace feels a bit all over the place. This is hit home when, after an admittedly exhilarating and action packed chase scene (on which the movie feels like it should end) it spends the last twenty minutes in a quiet bar, slowly losing air like a deflated party balloon. 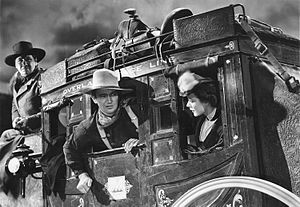 But as I mentioned above the film is home to an absolutely astonishing chase scene, where those on the Stagecoach must defend themselves from an Apache attack with the aid of a local cavalry. This sequence is incredibly well paced and shot, and far ahead of its time. It really feels like it should come at the end of the film, but sadly doesn’t. It also has John Wayne in what was a career-starting role. Whether you see that as a good thing or not is up to you. So that’s the end of this entry, and we’re off to a mostly good start. I thoroughly enjoyed How the West Was Won and at least Stagecoach had an entertaining chase sequence. Comeback next time where I’ll be sharing my once again brief thoughts on 1952’s High Noon, and John Wayne’s response to it with 1959’s Rio Bravo.